An earlier version of this article was first published as Book Review: The Magic Mountain by Thomas Mann on Blogcritics.org. This is perhaps a mountain of a book that can be categorized as a spectacular piece of literature. You know, sometimes, a grandiose book would appear, and it is grand and spectacular, not simple because of its size, but because it is a magnificent tour de force in all respects. Works such as Thomas Pynchon's V and Roberto Bolaño's 2666 come to mind. 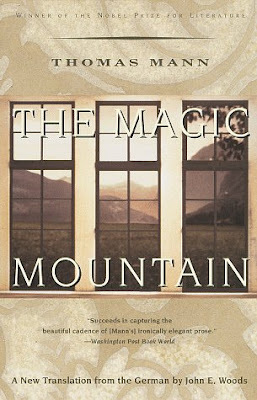 I believe The Magic Mountain by Thomas Mann is another one of them. So before I review this book, let me provide the requisite synopsis. The Magic Mountain takes place in a sanatorium in Davos, in the Swiss Alps. The story is set in the early twentieth century, and revolves around Hans Castorp. Hans Castorp heads up to Davos to visit his cousin, Joachim Ziemssen, who has been undertaking treatment in the sanatorium. What initially is planned as a 3-week visit ends up to be seven years, as Hans Castorp visits his cousin, develops a sickness of his own worth curing, and interacting with the various characters that are present in his surroundings. People come and go, and characters enter and exit, either temporarily (by heading down to the flat lands) or permanently (by dying). So, perhaps the most troubling aspect about this book is about coherence. I have this idea that it is just too big to be a coherent work. I felt the same way with respect to Roberto Bolaño's 2666 as well (however, I think that was the beauty of that work, that it was mysterious and slightly incoherent). For The Magic Mountain, however, it is coherent, but certain bits and pieces make me do a double-take on that factor. See, I think this is a novel that functions as a vehicle for Mann to illustrate the various philosophies that are prevalent during his day. Characters are actually allegorical and symbolic, and stand as archetypes for different philosophies. Ludovico Settembrini for example is the personification of humanism, while Joachim Ziemssen is the person who always follows duty over anything. Naphta on the other hand is the radicalist. And the whole novel is just a dialogue between these different people, as Mann provides an exposition with respect to these different philosophies. Crucial to the story is Hans Castorp, the innocant bystander. At some level, he is the topic of the novel, as he is the prime character. But at another level, he is just a bystander whose function in the novel is to witness the different expositions and illustrations of these different philosophies. His body temperature is modulated by these expositions, and actually tips back and forth as a reflection of his personal belief. That I thought was a neat literary trick. The aspect I do not like about this work, however, has something to do with overall coherence. My previous paragraph mentioned this idea that this novel can be analyzed in different levels, which is fine. What I didn't like are these little snippets or sub-plots in the story, which don't seem to provide a purpose. One such example is the sub-plot that revolves around Elly Brand, the Danish patient who seems to be psychic and becomes the spirit medium of a ghost by the name of Holger. I just don't see how this sub-story related with the overall picture. And unlike Roberto Bolaño's 2666, I have a hard time seeing The Magic Mountain as hyperlink literature. Overall, however, I still think positively of this book. It was a good exposition of the prevailing philosophies during Thomas Mann's time. And because of that, I am not surprised that this is rated as one of the best examples of German literature out there. I give it 4 out of 5 stars.